True ownership of one share of Fox Corp stock framed like you want. The recipient becomes a real shareholder of the company. For the Conservative that has everything! 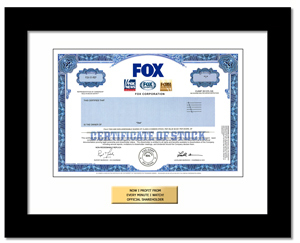 The replica Fox stock certificate displays the logos of its flagship segments. Fox Corp is a powerhouse in broadcasting with Fox News, Fox Business, 28 Fox Television Stations, Fox Sports 1 and 2 as well as the Big Ten Network.